The entire movie takes place in a single room, a dull gray industrial looking enclosure. 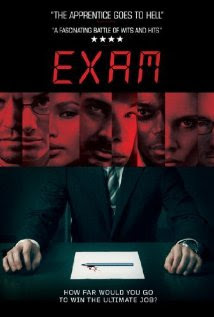 The movie has all of 10 actors - the 8 candidates plus the invigilator and a guard. In an interesting twist, none of the characters are named, instead they get colorful nicknames courtesy one of the candidates - White (Luke Mably), Chinese (Gemma Chan), Black (Chukwudi Iwuji), Brown (Jimi Mistry), Blond (Nathalie Cox), Dark (Adar Beck), Brunette (Pollyanna McIntosh) and Deaf (John Lloyd Fillingham). It is the characters, with more than a little technical help, help pull the movie together. Each stays true to a core, yet evolve to keep the proceedings interesting. After all the proceedings are little more than 8 nervous candidates talking to each other in a gray room. The story is obviously inventive, but flat at times. The company that they were purportedly going to get the role of the assistant to the CEO for has a 20 billion turnover, and a market cap of 60 billion. In today's world that would barely make it to the top 500 companies. Not exactly a job to kill for. That said there are other redeeming wins for the movie, starting with the cinematography. The camera focus flits wonderfully from character to character, taking on a narrative of its own. The shot angles are always tight, never leaving a character out in the cold. The music too never misses a trick in keeping the bass on to keep the adrenalin going. It is the characters and the technical merits that pull their weight around a plot as thin as the blank paper with no question on it. You will need to stretch the imagination cells for this one. But once you accept the possibility that you could conduct an interview of that sort without HR going ballistic on you, the movie is actually absorbing. With just a bit of violence and not too much yelling and screaming, it is a perfect thriller for sensitive company.